Sharing a border with both Italy & Austria, Slovenian skiing is Alpine skiing. The vast majority of resorts are in the North as the Alps east of Cortina in Italy & south of the Austiran Tyrollean Alps continue through Slovenia parting around major city of Ljubljana before giving way to rolling hills & broader valleys. The exception to the rule are the resorts of Bela & Sviscaki on the southern border offering a unique but brief ski experience. With over 10 major resorts in the Slovenian Alps there’s more going on in Slovenian skiing than you might imagine. Kranjska Gora, Vogel & Krvavec are amongst the most popular with Brits but we make up a tiny fraction of those that ski there. 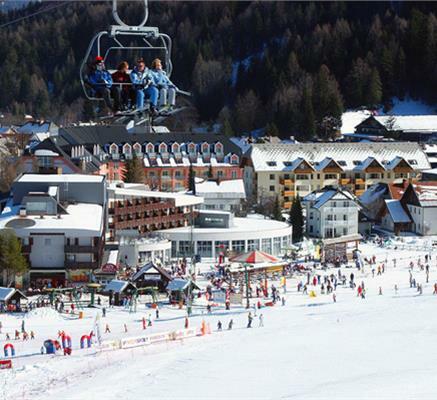 Prices are excellent, pistes, lifts & facilities are good & getting better fast resorts both modern & more traditional can be found. Dominated by the majestic Julian Alps, the pretty village has just 20km of piste in spectacular surroundings.